Last week I completed a 2-month project by running a marketing workshop at the Us Girls conference. 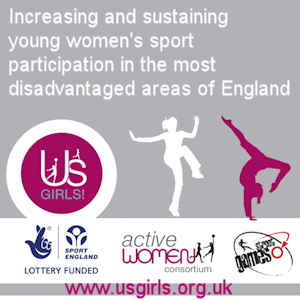 Us Girls is a Sport England funded initiative that aims to get 30,000 young women living in disadvantaged areas more active, by providing them with opportunities to play sport within their local communities. The project will run from 2011 – 2014 and 64 organisations will focus on over 50 specific areas of high disadvantage spread throughout England. The work is focusing on the market segment, defined by Sport England as ‘Leanne’, aged 18-25 and emerging Leannes who are aged 16-18yrs. Paul Jarvis from StreetGames put Karen Keohane and myself in touch to help with the marketing of Us Girls. We met up and discussed what was needed to help the Us Girls coordinators to market their schemes more effectively. I put forward a few options for different budgets, and Karen decided to go with a bespoke marketing book, showing exactly how to run your marketing, and a workshop at the Us Girls conference. The book was 170 pages of clear, step-by-step instructions on exactly how to run the marketing to attract Leannes to your project. It also included 11 case studies of projects that had been successful in marketing to Leannes around the country. The workshop went well, with lots of discussion and ideas from around the room. It got an average feedback score of 8.2 from everyone who attended. Hopefully the book will be useful to everyone involved in the Us Girls project over the next three years.